Source: Rev. Richard R. Chope, Carols For Use In Church (London: William Clowes & Sons, 1894), Carol #131, pages 244-245. In sending us His well-beloved Son. For sweet it is, Blest Mary's Son to praise. Then, one and all, &c.
Born of a Virgin, yet a Heaven-made Bride! But poor and mean to make us Heavenly great. Was nourished by His Mother, Maid, and Wife. The Holy Church's Wondrous Sacrifice. Sheet Music by Mr. A. H. Brown from from Rev. 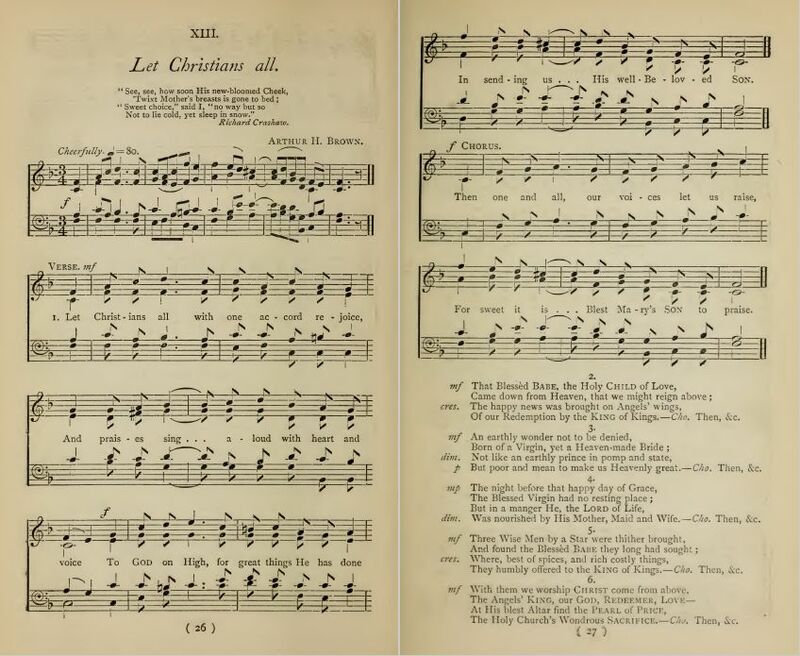 Richard R. Chope, Carols For Use In Church (London: William Clowes & Sons, 1894), Carol #131, pages 244-245. Sheet Music from Arthur Henry Brown, ed., In Excelsis Gloria-Carols for Christmastide (London: Thomas Bosworth & Co., 1885), Carol #13, pp. 26-27. Compared to the 23 verses in Bramley and Stainer, this version has verses 1-4, 7, and an entirely new, last verse, with a chorus. The Black Decree - Version 2 - Walters, A Good Christmas Box, 1847. For the Feast of the Holy Infants. The Black Decree - Version 3 - Chope, 1894. 6 verses, with chorus. For Epiphany. The Black Decree - Version 4 - Rodda, 1870. 3 verses, with chorus. For Christmas. The Black Decree - Version 5 - Broadside Harding B 16(341a), ca. 1820-1830s. For the Feast of the Holy Infants. 18 Verses. The Black Decree - Version 6 - Broadside Douce adds. 137(31), between 1821 and 1827. For the Feast of the Holy Infants. 20 Verses. The Black Decree - Version 7. Broadside Harding B 7(58), between 1813 and 1838, and Broadside Harding B 7(78), between 1859 and 1899. For Christmas. Five verses, no chorus. The Black Decree - Version 8 - A Shropshire Version.